If NASA continues to be funded at its current levels, a manned mission to Mars could be permanently beyond reach, space industry experts say. When asked how soon astronauts could potentially set foot on Mars under NASA's current budget constraints, Thomas Young, the former executive vice president of Lockheed Martin, says the outlook is bleak. Steven Squyres, the principal investigator for NASA's Opportunity rover now exploring Mars, agreed. Squyres, an astronomy professor at Cornell University in Ithaca, N.Y., also gave testimony before the House subcommittee. Challenges ahead for human explorers of Mars given the toxic nature of perchlorates that are pervasive on the red planet. Young said that if the public and government officials treat a mission to Mars with the importance of the first mission to the moon, it is possible to put boots on the Red Planet in a little more than a decade from now. "Mars is harder; there are a lot of significant issues to resolve before going to Mars," Young said. "But I think that if we had the same national commitment to it [as we did to going to the moon], I would say by 2025, we could land on Mars." The current draft of NASA's budget produced by the House asks the space agency to develop a roadmap that will define the technical capabilities needed to send humans to Mars sometime in the future. "I think the roadmap requirements in the bill are overconstrained," Squyres said. "I think the idea of establishing a roadmap for human exploration of Mars is great. It's one of my favorite provisions in this bill, but I think it would be best to allow NASA to do that problem, to work out that roadmap in its technical details and find the best way to achieve that and then come back with a set of recommendations for what the intermediate milestones should be." One of those intermediate steps could be another mission to the moon. However, Young doesn't think that a lunar mission is a necessary requirement for setting foot on Mars. "I do not believe that landing on the moon or operations on the moon is a prerequisite to going to Mars," Young said. "Given Mars as the focus, it's not necessary. It's probably a significant resource consumer that will take away from the time and effort to go to Mars." 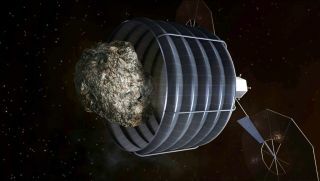 As it stands now, the budget draft expressly prohibits NASA from carrying out the asteroid-capture mission that would send a robotic spacecraft to redirect a near-Earth asteroid into lunar orbit. The mission was written into President Barack Obama's draft of the NASA budget released earlier this year. "While the committee supports the administration's efforts to study near-Earth objects, this proposal lacks in detail a justification or support from NASA's own advisory bodies," Rep. Steven Palazzo said of the proposed mission. "Because the mission appears to be a costly and complex distraction, this bill prohibits NASA from doing any work on the project." Under the newest draft, NASA's budget comes in at about $16.8 billion and authorizes the space agency to continue operations for another two years, Palazzo said. The bill also cuts almost $650 million in Earth sciences program funding and sets a Dec. 31, 2017, flight readiness deadline for NASA's commercial crew program. "This authorization bill reflects a sincere effort to maximize return to the taxpayer while working to protect America's role as the world leader in space exploration," Palazzo said. "It is realistic and reflective of the hard choices we must make as a nation and provides support for agreed-upon priorities."